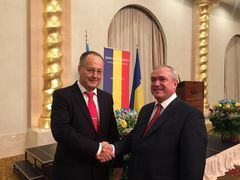 Embassy of Romania to the Republic of Azerbaijan gave an official reception on the occasion of Great Union – National Day in Baku, on December 1st. Representative of the governmental authorities, Ambassadors of foreign countries, representatives of diplomatic structures, organizations in Baku, including representative of the PS IGC TRACECA as well as high ranking officers, NGO`s and other officials were present at the reception. During the reception, Mr. Mircea Ciopraga, Secretary General of the PS IGC TRACECA expressed his gratitude to H.E. Mr. Daniel Cristian Ciobanu, Ambassador Extraordinary and Plenipotentiary of Romania to the Republic of Azerbaijan for the invitation and congratulated on the National Day. As the member-country of the IGC TRACECA since signing of the Basic Multilateral Agreement (MLA) Romania makes important contributions to the development of the international transport corridor Europe-the Caucasus-Asia.